Way back in 1492, Christopher Columbus sailed the ocean blue. Luckily for us, he brought back with him the versatile chile. The countries that spice up their dishes with this lovely addition are plentiful, and include India, Mexico, South America, Spain, Thailand, and the US. Most crushed red pepper usually comes from the long, red New Mexico chile. 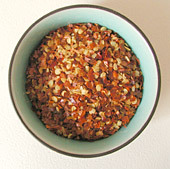 These days, red pepper flakes are a common substitute for plain old black pepper, as the heat quotient is easily gauged and adds both dimension and flame to the most common dishes. Try adding just a pinch to skillet-fried, salted potatoes. It’s a brand new dish and a sure-fire hit. This entry was posted on Saturday, November 3rd, 2007 at 6:11 am	and is filed under Encylopedia, Herbs & Spices. You can follow any responses to this entry through the RSS 2.0 feed. You can leave a response, or trackback from your own site.